In a large heavy skillet over medium high heat, cook the butter and garlic, stirring frequently, until the butter just begins to brown, 5 to 6 minutes. Stir in the water, cabbage, 1 1/2 teaspoons salt and 1/2 teaspoon pepper. 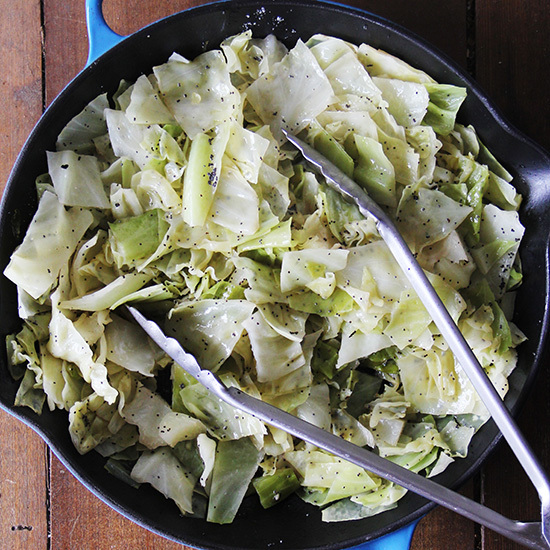 Cover skillet and cook, stirring once or twice, until the cabbage is crisp tender, about 8 minutes. Uncover the skillet and continue to boil until all the liquid in the skillet has evaporated, about 6 minutes more. Stir in the poppy seeds and season with salt and pepper to taste. Serve.